Vendredi Screen Print was established in 1992. We pride ourselves on providing a good quality product & service at not only a very competitive price but also delivery on time to meet deadlines. Vendredi Screen Print supplies general screen printing on a variety of substrates, including stickers & labels, display & site boards, industrial panels, cases & fascias, leisure & work wear either printed or embroidered. 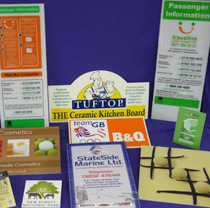 Digital printing or computer cut vinyl lettering & logos for vehicle graphics, sign & display boards, shop & window displays, boats, banners, magnetic signs, swing & "A" boards. Vendredi Screen Print offers a friendly quality service from design to manufacture & installation whether you are after a couple of stickers or T shirts, or you want a complete corporate image for shops, vehicles & garments.